PEARLAND — The Dawson Lady Eagles scored 71 points for fifth place at the Alief Relays. There were 14 teams that competed at the track meet. Hightower won the meet with 128 points followed by Lamar (113), Seven Lakes (94), and Cinco Rance (84) as the teams finishing ahead of Dawson. 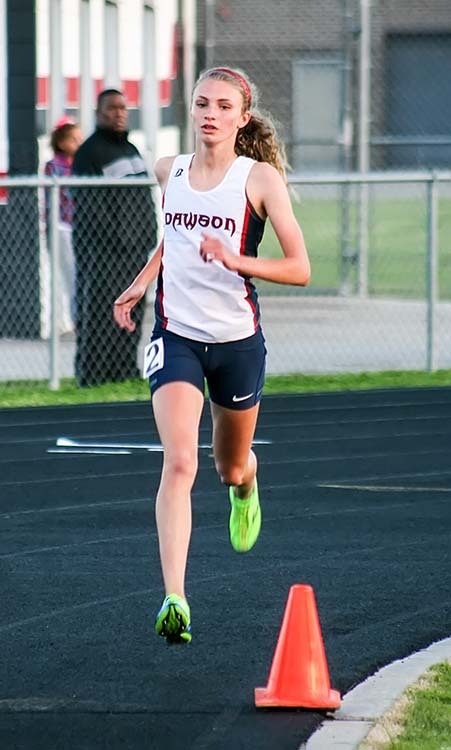 Abbie Harrelson was the shining star for Dawson as she won the 1600 meters in 5:11 which also broke the Dawson High School record in that event. Harrelson's time is the fifth fastest time in the state and 10th in the nation this year. The 3200 meter relay team of Miranda Thornhill, Bethany Taylor, Harrelson, and Kaith Johnson placed third in 10:18.7. Jemira Thomlinson placed second in the discus (119-0). Katherine Darden placed fourth in the high jump (4-10). The 400 meter quartet of Destini Jenkins, Cydney Boudreaux, Nailah Henderson, and Paige Kimble placed fifth in 48.44. The Distance Medley Relay foursome of Thornhill, Carrington Small, Taylor, and Harrelson placed fourth in 13:05. Boudreaux placed fifth in the 100 meters and Henderson place sixth. The 800 meter team of Leia Flynn, Taylar Prier, Anteria Richardson, and Christian Wiley placed fifth in 1:47.4. Taylar Prier placed second in the long jump with a leap of 16-10. Kimble won the 400 meters in 58.02.